Why go? To completely reboot your mind and body. Satvada Retreats runs a variety of three and five-day yoga and meditation breaks in beautiful locations in Morocco, Croatia and Suffolk. Whether you’re a yoga buff or a newbie, travelling solo or with a friend, these retreats – run by yoga teacher Lucia Cockcroft and her partner Darren Cooper – are super-friendly. Every day is properly structured but also very relaxed, so you can join in as much or as little as you like. My holidays usually involve a gaggle of husband, kids, siblings or friends, so this is my first-ever solo get away. While I want some much needed peace and quiet, I don’t want to feel – heaven forbid – lonely. Joining my group of 15, I find I’m part of a fantastic bunch of like-minded professional women (and one man) that includes a psychotherapist, a charity CEO, a geologist, and an HR director. When? Satvada schedule their Morocco retreats to avoid the intense heat of July and August and are mostly held at times of the year when you can expect some decent sunshine and mid-20°C temperatures, and get an off-peak deal on flights. 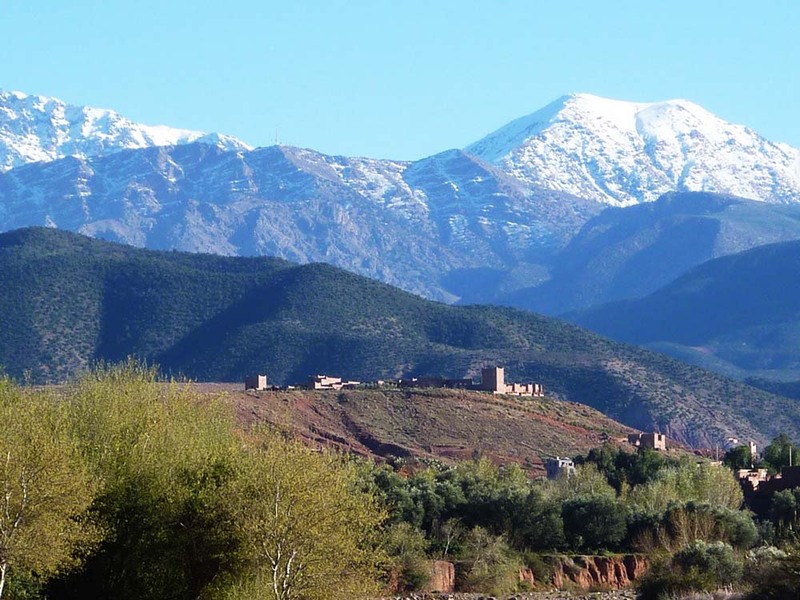 Marrakech is an easy just-over three hours flight from the UK (with no time difference) and the transfer from the airport south to Kasbah Angour, in the foothills of the Atlas Mountains, takes just 40 minutes. You really must: Get up early to watch the sun rise over the snow-capped Atlas Mountains, before waking up your mind and body at 7.30am in the first of the day’s two yoga sessions. Lucia teaches restorative yoga – gentle positions that stretch your body and focus on alignment. Each class is topped and tailed with mindful meditation, in which we focus on our breathing, the sounds around us, and letting our thoughts come and go ‘without judgement’ but always returning to the breath. I find it hard to get the hang of this at first, as my mind is still on London speed, but Lucia’s soothing voice reassures us that over the next five days we have the ‘luxury of time’ and should indulge in it. She finishes each session with a really thoughtful poem, my favourite being ‘Earth Teach Me Stillness’ by Nancy Wood. By day two, I find my thoughts are no longer racing, and I can observe my emotions without getting caught up in analysing them. It’s a very powerful feeling. After breakfast, we swap yoga gear for walking boots and head off on a two-hour walk. Each day Abdul, our guide, takes us in a different direction from the hotel – through Berber villages, along dry, wide, rock-strewn riverbeds, past olive groves being harvested in the red earth of the Atlas Mountains. By the time we return for lunch we are hot, hungry and happy, then we have the afternoon at leisure to relax by the pool before our 5.30pm yoga session. Although dinner is a three-course affair, I can’t wait to get into bed with my book by 9.30pm and the prospect of a long deep sleep. On day three, there is an afternoon and evening visit to Marrakech and I leap at the chance as I’ve never been before. We spend an hour in the Marjorelle Gardens (jardinmarjorelle.com) on the Rue Yves Saint Laurent, a small oasis in the middle of the city. After wandering through the cactus and bamboo, then visiting the gift shop to admire très expensive leather slippers appliquéd with YSL’s Love design and versions of the designer’s signature silk tops and harem pants, I sneak off to sample the cafe’s deliciously fragrant orange flower ice cream. Next is a guided walk around the former presidential palace, then onto the hurly-burly of the Jemaa el-Fnaa square. After the peace and relaxation of our retreat, the noises, smells and assault on the senses is almost too much and I’m glad when we escape the souk for dinner at Pepe Nero (pepenero-marrakech.com), situated in a beautiful riad offering a mixed menu of Italian and Moroccan food. 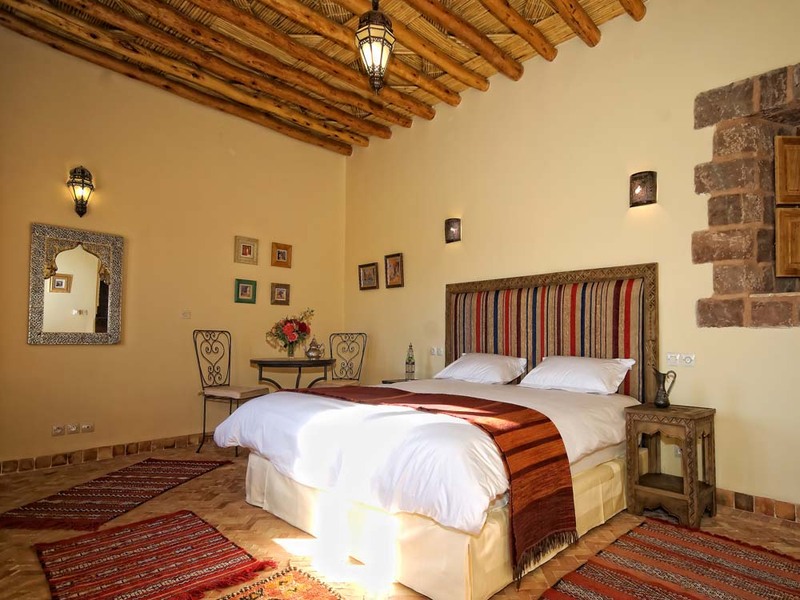 Stay at: Our retreat is based at Kasbah Angour (kasbahangour.com), a boutique hotel built in the style of a Berber castle and situated on a small hill near Asni with a spectacular view of the mountains. Opened five years ago and run by Englishman, Paul Foulsham, its 26 rooms and suites feature terracotta-tiled floors, Berber rugs, punctured tin wall lights and mosaic-inlaid tables. The gardens make a lush green contrast to the red earth of the mountains, and the splendid pool and terraces are a delightful place to chill out. A word of warning – be prepared for a 5am alarm call, as mosques in the surrounding villages announce the call to prayer each morning. Surprisingly, I find it charming and exotic, and easily roll back to sleep straight after. Dine at: We take all but one of our meals at the hotel, and as you’d expect it’s a healthy affair. ‘Berber’ eggs at breakfast are fried and served with tomatoes and harissa. Lunch and dinner are a selection of tagines, grilled vegetables, fresh salads, lentil or pumpkin soups and couscous. And each day there’s a yummy, well-earned slice of cake for afternoon tea. Pleasantly full, but rather virtuous, is the end result. Bring home: A whole new outlook on life! Yes, there is an overwhelming choice of lanterns, earthenware tagines and colourful home wares to be picked up in the souk, but that’s not why I’m here. Personally, if I can get into the swing of practising mindful meditation every day, that will be the best souvenir I could ever bring back. (I am now the proud owner of Mindfulness: A Practical Guide To Finding Peace In A Frantic World by Mark Williams and Danny Penman (£13.99; Piatkus; franticworld.com), and have downloaded the CD on to my phone as an added incentive.) The one treat I do buy is argan oil, which is made locally, often by women’s co-operatives. It’s super healthy and can be used to drizzle over salads, and is now a wonder ingredient found in lots of beauty and massage products. Book now: easyJet (easyjet.com) flies to Marrakesh from four UK airports, from £76 return. Satvada Retreats (satvada-retreats.co.uk) offers a five day walking and yoga holiday at Kasbah Angour from £899 per person (based on two sharing a twin/double room), or £999 single. This includes yoga, walks, all meals at the hotel and a trip to Marrakech. A three-night Wellbeing Weekend based in Marrakesh, including twice-daily yoga sessions, costs from £449 per person (based on two sharing), or £599 single. Flights and transfers are extra. Info: Morocco (Rough Guides; £16.99) is an in-depth guide, and see visitmorocco.com.